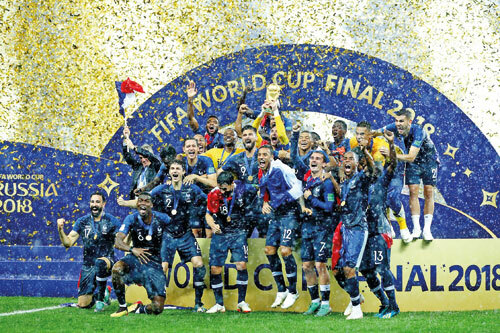 After this World Cup victory, can France finally throw off racism? This entry was posted on 22/07/2018, in Analysis, Culture and Traditions, Ethics | Morals, Hard Facts, Hypocrisy, Laments, Racism| Fanaticism, Rights|Freedom and tagged France-World cup, Migrants. Bookmark the permalink. Liberté, egalité, Mbappé! After France’s World Cup victory on Sunday, the French slogan was rewritten to celebrate a winning goal by a 19-year-old player from the Paris suburbs who is donating his World Cup fee to charity because, he says, it is such an honour to play for his national team. A startling recent report by the French national commission on human rights (CNCDH) stated that Muslims “remain among the least accepted minorities, with the rejection often extending from Islam, to the entirety of its practitioners”. French Muslims may be leading their nation to the biggest prize in world sport, yet 44% of French people believe Islam is a threat to French identity. Even prayers are a problem for 30% of French people who think they are “not compatible with French society”. Not a single minority achieves over 80% “tolerance” in France today. Fraternité, anyone? Yet, away from sport, one man’s battle against the state may offer a glimmer of hope. In February, the government brought in some of its toughest laws related to asylum, doubling the time for which undocumented migrants can be detained (now 90 days), and making the illegal crossing of borders an offence punishable by one year in jail, plus fines. Charities referred to the new laws as “an unquestionable break with France’s tradition of asylum”. Herrou, an olive farmer from the Roya valley, which stretches between France and Italy, first came to public attention last year when he was fined euros 3,000 (£2,700) for assisting dozens of migrants. He has argued that he and his friends are being persecuted for a “crime of solidarity”. To his detractors, he’s endangering the nation in a country where immigration is now consistently framed in terms of national security and terrorism. To his supporters, he embodies everything France claims to stand for – freedom (of movement for all), equality of all peoples, and fraternity regardless of class, creed or colour. And last Friday, France’s constitutional court ruled that the country’s core “principle of fraternity” protected Herrou from prosecution. It said: “The concept of fraternity confers the freedom to help others, for humanitarian purposes, without consideration for the legality of their stay on national territory.” This decision is hugely significant in a Europe that has grown increasingly hostile to migrants. When I met some of Herrou’s friends last year, they explained that the assistance they provide did not start out with any grand ideological intent. As “mountain people”, as one man described them, they abide by a simple, but critical age-old code that has ensured their survival. It states that if you find someone lost in the mountains, you provide food, shelter and help them along their way. For the people of the Roya valley, they told me, this has always been the rule. And one which must apply to everyone, no questions asked. Herrou’s case is a historic moment – one man’s campaign has forced the government itself to question its values. And it should force us all to confront the dangerous trap of only recognising as French – and by implication of accepting as fully human – those people of colour who undertake extraordinary acts. Those who save children from falling from buildings, or those who win global sporting tournaments. Sunday was an important symbolic victory, and the message was clear: this is us, black, Muslim, French, African, “banlieusard”, and we are the best of France. Yet in the struggle over Europe’s very soul – the ideals we claim to want to foster and advance through it – Herrou has shown us it is still possible to recognise how far we may have strayed. Let’s take inspiration from the picture the national team paint for us, but not forget it takes long, hard and often overlooked battles to make that image more than a distraction.